Dr. Troy Kaji talks about the history of the Japanese Hospital on Nov. 8 in Boyle Heights. He is joined by Carole Fujita (right) and Kristen Hayashi. The Boyle Heights History Day, co-sponsored by the Boyle Heights Historical Society and the Little Tokyo Historical Society, and held at the historic Breed Street Shul on Nov. 8, was well attended by a diverse audience and included a visit by native son, Rep. Henry A. Waxman. 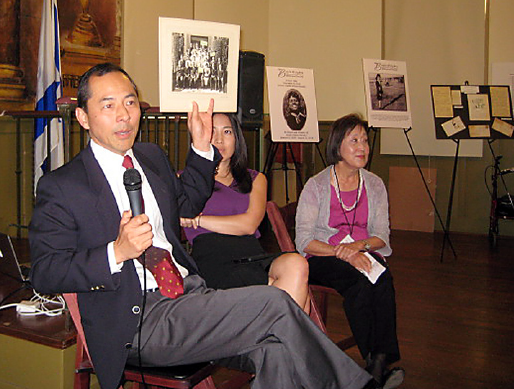 The family stories of Mollie Wilson Murphy, an African American raised in Boyle Heights, endeared the audience with the telling of her friendships of all ethnicities and her well-documented correspondence with her Japanese American friends while they were in the American concentration camps during World War II. The panel discussion included Dr. Troy Kaji, Carole Fujita and Kristen Hayashi speaking on the former Japanese Hospital on South Fickett Street. This included the life of the Issei and Nisei doctors at the hospital after it opened in 1929 as a result of the U.S. Supreme Court decision in 1928 (stemming from the California Supreme Court case, Tashiro v. Jordan), the significance of Sei Fujii’s and J. Marion Wright’s role in the hospital becoming a reality and their background stories in the “Lil Tokyo Reporter” short narrative film, and LTHS’ efforts in applying for the City of Los Angeles’ Historic-Cultural Monument designation of the still-in-use building. There was also a dramatic reading of “Yuriko & Carlos,” a prize-winning story in the LTHS’ recent “Imagine Little Tokyo” Short Story Contest, by the author, Rubén Guevara, and a screening of “Stand Up for Justice: The Ralph Lazo Story” by John Esaki, writer and director. For information on the Japanese Hospital and LTHS, contact Michael Okamura, president, at [email protected] or (626) 840-8409.